I hate feet, it isn't a new fact and it isn't even that unusual, what's more, I hate my feet being touched full stop so when I was given the chance to enjoy a pedicure, I was in part filled with dread that I wouldn't enjoy it and fearful that as soon as someone touch my feet, I would, as I usually do, kick out! Boutique Spa is the sister company of Spa and Massage, which I have recently visited and reviewed here and it is based in Queensway, just a few stops up from Oxford Street in London with another to open in Fitzrovia later this year. As with its sister company, Boutique Spa aims to make having a treatment easy and is open on Monday to Saturday from 10am until 9.30pm and on a Sunday from 10am until 8pm, they offer a walk-in, no appointment necessary service or you can also book a treatment in advance. Upon my arrival, I was greeted with an offer of freshly made Lemonade, Water or Tea and then asked to choose a nail polish that I would like used for my Classic Pedicure. Gratefully accepting Lemonade, I looked at the wall, yes an entire wall, full of nail polishes and eventually settled on an Essie Shade which is quite unlike anything I would usually choose. Once I had chosen my nail polish, I was taken over to the Pedicure section of the Boutique and told to get myself comfortable, remove my shoes and relax. What I liked about this Boutique was how clean it was and having got myself relaxed into a chair, I could have quite happily sat there all day just watching the world go by. Nothing was too much trouble and I was kept hydrated the whole time I was in the Boutique. I was to have the Classic Pedicure which lasts for 45 minutes and costs just £35. The treatment include smoothing of the feet, cuticle tidy, foot massage, shape and then polish. So once my feet had been soaking in the amazingly warm water, absolute heaven as my feet were pretty tired and aching from all of the walking I had done that day. The first part of the treatment my therapist did was to cut my talons, file them into shape and then tidy the cuticles around each nail, a totally painless exercise and one, which like your fingernails, is important. Once the massage was complete, it was time to paint my toe nails, it is rare that I have no nail polish on my toes and when I do, it is always a dark polish. Having had a base coat applied, the Essie shade I had chosen, Sunset Sneaks, was then applied and then a cuticle oil. I was then told to sit back, relax and wait for the polish to dry, which I did. The whole treatment lasted 47 minutes and it was so much better than I had anticipated it would be. Not once did I flinch or get the urge to kick out, infact I enjoyed the whole process so much, I didn't want to leave. 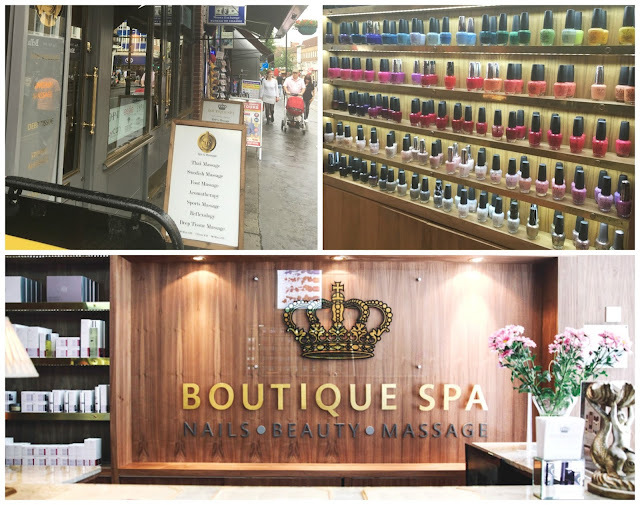 Boutique Spa is a fantastic little find. The staff are incredibly welcoming and easy to chat too, nothing is too much trouble and the entire experience is so incredibly relaxing with the scent of aromatherapy oils in the air and some light music in the background. So if you are in need of a lunchtime treat, this place is the the place to be! As much as I love having freshly painted toes - I hate getting pedicures. I have such ticklish feet then I can't control the urge the kick when I get one done! I could so do with a bit of pampering right now, never actually had a pedicure before. I've never had a pedicure before but am planning on getting one before we go on holiday. I have never had a pedicure before, but I don't love the way my feet look, so maybe I should have one haha. I'm not a fan of having my feet touched either. I have never had a pedicure but it sounds relaxing if I could get over my weird "don't-touch-my-feet" thing. On my honeymoon I had the opportunity to get a fish pedicure where little fish nibble your dead skin. I giggled the whole time because it tickled. I love getting pedicures, I normally choose one with a paraffin wax bath too - really helps to moisturise and soften the skin. It sounds like you had a lovely relaxing time and it's nice to be pampered. I am not a fan of feet either but I desperately need a pedicure, I need a good spa day! What a nice experience. I'd go here for a little relaxation. They sound like experts. I have not had a pedicure in ages. I need to get one I can use at home. I bet you enjoyed this. It is been ages I have had pedicure. 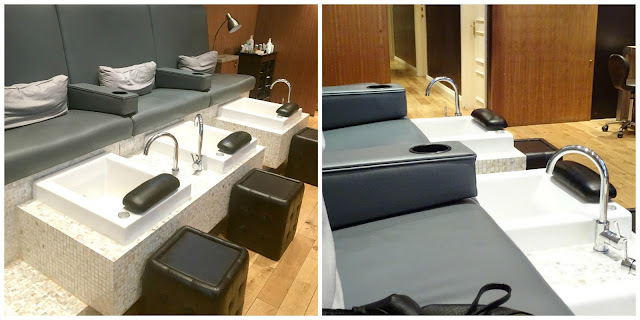 Boutique Spa isn’t too far from where I live, I guess I will be visiting soon. This is a just a good reminder I am due for one. I nearly always play it safe with a pedicure and go for the same two colours, but I never regret it when I do go for something different. It looks a very swish spa to go to. I love a good pamper session. Amazing shades of polish they have. the place looks very comfy and the service sounds impeccable. I hate feet too! I don't know how these people do it I am so overdue a pampering session I haven't had a pedicure in yearsyears, I think its time for one. I find it is so difficult to relax during apedicure!!! so much tickle, scratchiness and uncomfortableness (if that's a word)...glad you found a place you enjoy!! That looks like a lovely spa, but I don't think I'd ever get a pedicure! I have never gotten a pedicure you pretty brave for taking pictures and all. The spa looks lovely.